1. Young people lack ‘financial planning’ and budgeting’ skills, the most missing and needed financial skills to enter the workforce – whether as an entrepreneur or employee. 2. 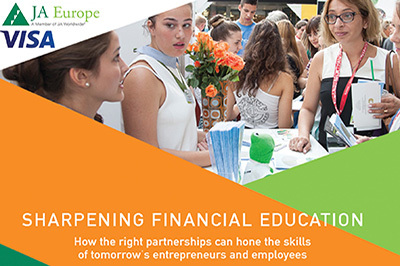 European educational systems should contribute more to equipping young people with the right financial skills. 3. A combination of public and private initiatives would be the best way to improve financial literacy. [Brussels, Belgium, 27 September 2016] JA Europe and Visa Europe launched a survey in March 2016 in order to explore employers’ needs in terms of the financial skills and knowledge of young people entering the workforce. The research was conducted in collaboration with the European Banking Federation, the Organisation for Economic Co-operation and Development and the Vienna University of Economics and Business. It combines a pan-European survey of 500 members of the business community to identify the demand of financial skills and 5 national case studies based on the good practices in Poland, Romania, Spain, UK, and Turkey. The EE-HUB established an ad hoc working group on financial education to provide expert input on the project and drive further discussion within the network. “Business leaders should be more involved in financial education. It is not only an essential skill that makes young people more attractive to employers, but it’s also important to teach them how to take financial decisions that will improve their lives. This survey clearly shows that they can’t just rely on schools to deliver financial education, they have to step in and build now more effective partnerships with educators,” says Caroline Jenner, CEO of JA Europe. Key findings show that a vast majority of respondents underlined the fact that young people are not equipped in with key financial skills they need to start their working lives. In addition, future employees and entrepreneurs are perceived to need a different subset of financial skills: ‘analytics and mathematics’ is the most important for employees, whether it’s ‘business administration and management’ for young entrepreneurs. Still, many agree that ‘financial planning’ and budgeting’ are essential skills for both. How should financial education be delivered? It seems that public and private initiatives are the best way. In the private sector, already 63% of the respondents who are involved in financial education are also engaged in employee volunteering (which they consider as a win-win opportunity). Business representatives also consider that their national education systems need to update their curriculum. While showing interest in being more involved, business respondents mention issues such as time constraints and some schools not motivated to collaborate. Given the fact that educational reforms take time, this report aims to urge business to get involved. Europe cannot afford to wait and let young graduates miss out on opportunities, just because of a lack of motivation from both the education and business sector. So who should teach those skills? Schools are considered as the main actor. Parents should be more involved too. Public organisations recognize their potential to contribute, particularly when it comes to preparing young people for entering the workforce as an employee. Finally, NGOs are perceived as the best link between business and education, forging effective partnerships and providing volunteer opportunities are considered as extremely helpful. JA Europe is Europe’s largest provider of education programmes for entrepreneurship, work readiness and financial literacy. In 2015 we equipped 3.5 million students in 39 countries with the knowledge, skills and attitude they require to start a business or get a job. JA works with the education and business communities as well as governments to provide young people from primary school to university with experiences that build the skills and competences they will need to succeed in a global economy. JA Europe is the European Regional Operating Centre for JA Worldwide®.